It was over twenty years ago: we were in Canada visiting family and friends in Niagara Falls and Toronto, where I first discovered “tuesdays with Morrie”. To be precise, we were at my sister’s house in Oshawa, talking and discussing till late at night, when my sister said, “Kamran you must read tuesdays with Morrie: its all about an old professor and his former student”. This, for obvious reasons, caught my imagination. At the time I was a senior lecturer in economics at Coventry University. The next day, I recall, my wife and I went to Chapters Book Store and purchased the book. We got back home to England and I began to read the book. I found it fascinating. Here was a book on life’s big picture and the vital questions: Who am I? Where have I come from? Where am I going? What is the meaning of life? What is wisdom? What is good life? What is happiness? What is dying and death? “tuesdays with Morrie” has never left me. Yes, I moved on, put the book on one side and no doubt compromised. But, last night I rediscovered “tuesdays with Morrie” once again. 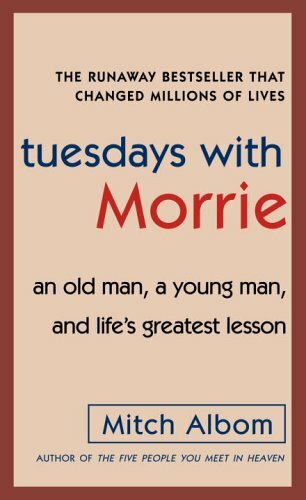 My wife and I were searching through our DVDs to find something nice to watch, when we saw “Tuesdays with Morrie”, a film starring Hank Azaria and Jack Lemmon. What can I say, but what a fantastic movie, what a brilliant true story. I realise that its insights are more relevant than ever. Wisdom, maturity, and happiness seem to go hand in hand with figuring out what life is all about and how we may live it. “Maybe it was a grandparent, or a teacher, or a colleague. Someone older, patient and wise, who understood you when you were young and searching, helped you see the world as a more profound place, gave you sound advice to help you make your way through it.